They say that love will arrive when you least expect it, often when it feels most inconvenient. Well, it turns out this adage doesn't just apply to human contact: I've fallen head over heels for a fragrance that is only available in a city halfway across the world. Long-distance relationships have never been my thing, but in this case, I'm a goner. And though I already have a bottle in my clutches, I'm already anxious about how we're going to make this work. The only ones who are probably more shocked about this development than I am are my co-workers, who have watched me accumulate dozens upon dozens of fragrances over the years (as you can see to my left in the photo below). I have always been a perfume polygamist. The issue was never that I hadn't found The One since I have so many scents that I truly adore. I have simply always loved the inherently abstract quality of fragrance and its ability to replicate a mood or memory through a carefully curated series of notes. There is nothing more comforting to me, for example, than the scent of sweet musk, amber, and lily—the notes of my mother's preferred fragrance, Dior's Dune (which, as fate would have it, she began wearing the year I was born). To that end, my fragrances have always served as an extension of my wardrobe—a visceral expression of my mood or even the weather outside; interchangeable on a daily (or even twice-daily) basis. I have tried to narrow down my favorites in vain, only to ultimately come to terms with the fact that I will always have at least four fragrances on rotation during any given season. Then, my friends at Le Labo sent me a sample pack of their City Exclusives collection, and everything changed. I was well aware when I began sniffing at the little vials that this could end very badly, since the whole point of the City Exclusives collection is that each scent is only available in its corresponding city around the world—you can't even purchase them online, save for one promotional month each year when the entire collection is available to the global population. But given my historic lack of commitment to any one scent, I figured that the risk was relatively low—until I took a whiff of a vial labeled Gaiac 10 ($300). I couldn't get it on my skin fast enough, perhaps in a last-ditch hope that this glorious, heady scent wouldn't be a match with my natural chemistry. In reality, all this did was seal our fate—we were meant for each other. Also telling: Within moments, I was surrounded by colleagues who had gotten a whiff and wanted to know more. 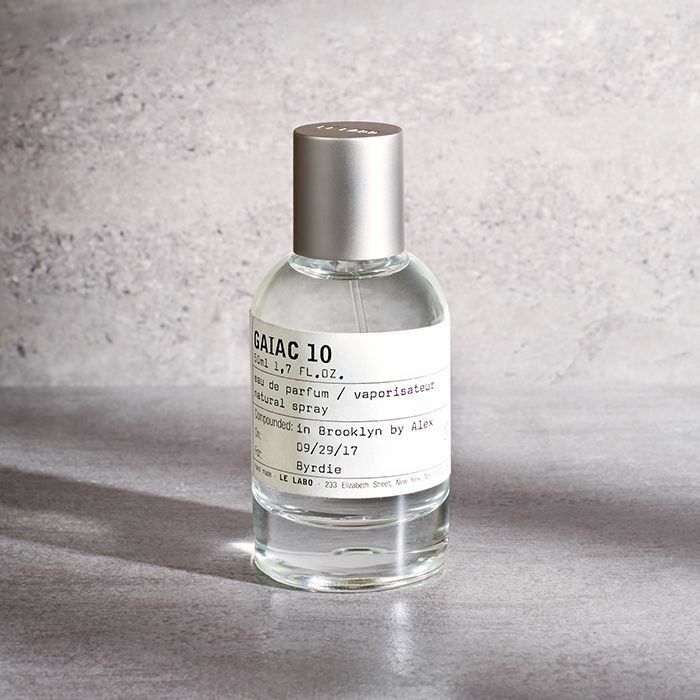 It's a little difficult to describe Gaiac 10, as its titular note is guaiac wood, which doesn't exactly bear the same kind of name-comprehension as patchouli or amber. With additional notes of musk, cedar, and olibanum (also known as frankincense), it's primarily a woody fragrance, but to me, it mimics the aroma of clean skin, with a touch of sweet incense. It's incredibly alluring in an understated, intimate way—like burying your face in someone's neck. It's the holy grail of "naked" fragrances; the kind of scent I want someone to remember me by. The caveat, of course, is that I didn't know which city Gaiac 10 hailed from—and a sneaking suspicion told me it wasn't L.A. or New York City. After some quick googling, I had my answer: Tokyo. The cost of my beloved new fragrance would be $300, plus airfare across the Pacific ocean. A forbidden love? The movie writes itself. Full disclaimer: The (very) kind folks at Le Labo saved me a trip (and, you know, rent) by sending me a bottle once I shared my plight. In the months since, I've been doing my best to ration it out, which is difficult when you've found a scent that you quite literally wouldn't mind bathing in. I can't exactly say that I might be passing through Japan at some point in 2018, but I can hold out hope for another City Exclusives promotion at some point in the coming year. Is this obsession highly frivolous and unnecessary? Obviously. Then again, we can't help who we fall in love with. Next up: The internet's favorite budget-friendly skincare brand is coming to Sephora.